“The cotton-top tamarin twins were born as part of a breeding programme at Marwell Zoo, near Winchester. They have been named Zambrono and Tol after places near the Las Coloradas Sanctuary in their native Colombia, South America. Marwell Zoo has been very successful in rebuilding the cotton-top population (albeit they are in captivity), they have breed over 50 individuals. The twins seem healthy and are being reared by both parents. I wish the zookeepers the best of luck, and if they happen to read this, keep up the good work! Great news! I’m just a little confused about the Zoo itself… you referred to the Hampshire Zoo, but when I click on that link it takes me to the Marwell Zoo. Is it simply that the Marwell Zoo is in Hampshire? Yeah Paul, sorry for not clarifying that. I was hoping no-one would catch that! Haha, oops. 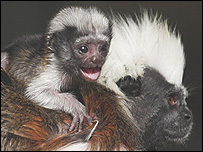 My understanding is that Marwell and Hampshire zoo either have a cooperation in cotton-top tamarin breeding where they exchange tamarins, or that Marwell Zoo subsidizes Hampshire Zoo in general (kinda like a parent zoo). I don’t know to be truthful though, maybe someone from the UK can help us out?